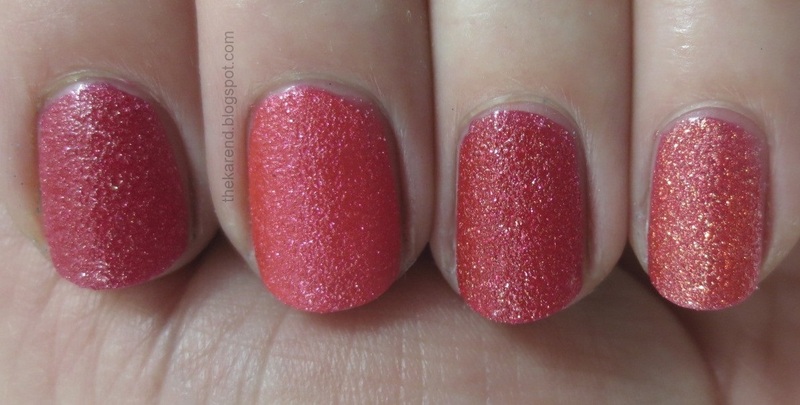 Nail Wheel Wednesday is being preempted today so I can bring you the conclusion of my OPI Brazil miniseries. 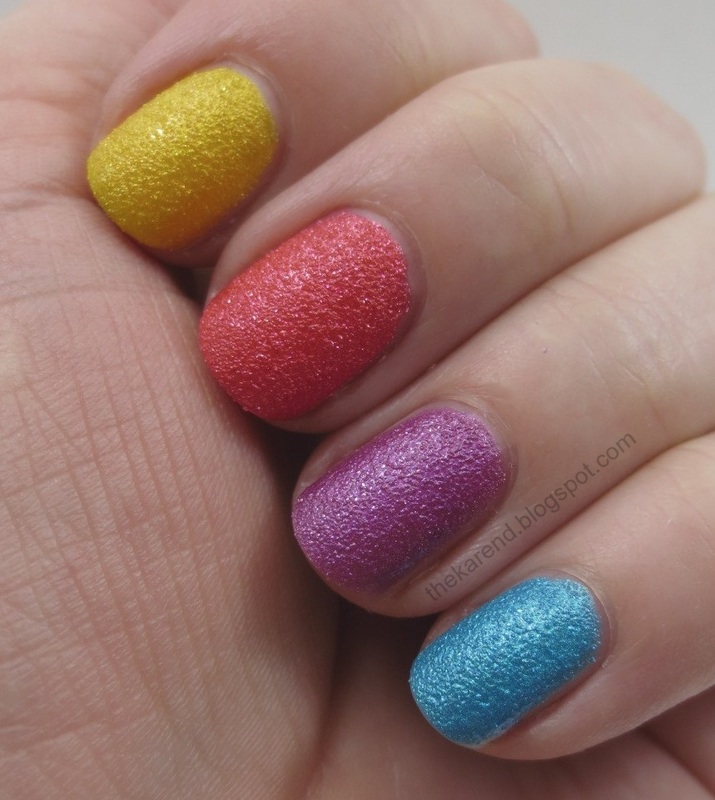 In addition to the 12 polishes we've looked at over the past couple days, OPI also is releasing some Liquid Sand colors as part of the Brazil collection, and they kindly sent samples for review. As far as I know, these only come in mini bottles in a set called Beach Sandies. I have yet to see this set in any store, but in a comment on my recent display post, reader Molly mentioned she spotted it on the Ulta website and it said online only. Because these are minis, I didn't want to use them all up swatching, so I Skittled them. 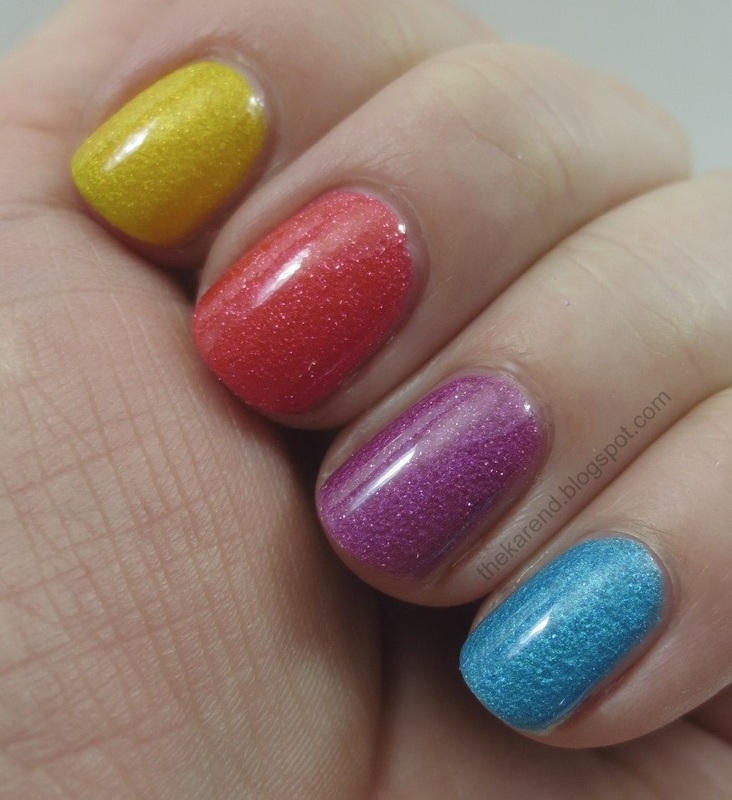 Top to bottom: You're So Flippy Floppy (yellow), I'm Brazil Nuts Over You (pinky coral), Samba-dy Loves Purple (warm bright purple), and What's a Little Rain Forest (bright blue). All were two coats and have subtly shimmery bases with fine glitter mixed in with the texture. By now I'm amassed quite a collection of textured polishes so of course I had to do some comparisons. Below, it's OPI You're So Flippy Floppy on the left and Sinful Colors Face the Facets on the right. The Sinful is a touch more glittery but the color is pretty much a match. Thanks to my friend The Canadian Nail Fanatic, I can say that Nicole by OPI Gumdrops Lemon Lolly is another good match even though that particular color doesn't seem to have made its way to the U.S. I couldn't find a match for I'm Brazil Nuts Over You in my stash. 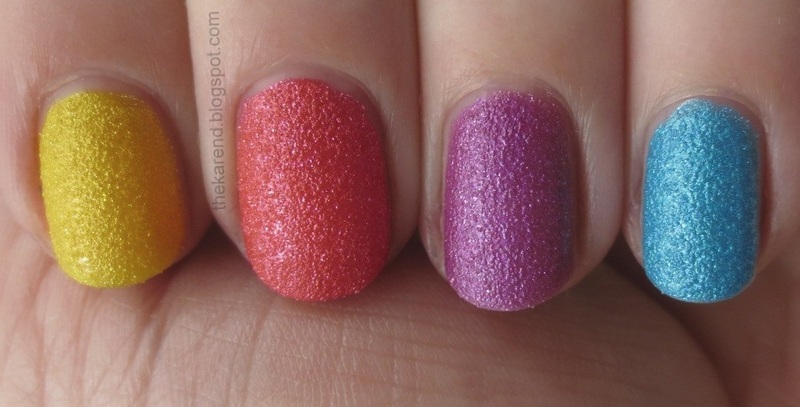 Left to right below: Sinful Ruby Mine, OPI I'm Brazil Nuts Over You, OPI Magazine Cover Mouse, OPI Jinx. The Sinful is much more red than Brazil Nuts. Magazine Cover Mouse is closer, but too dark and a touch red plus the glitter in it has too much gold in the mix; the microglitter in Brazil Nuts has a purpley pink tone. Jinx is way too oarnge to match plus it has even more gold shimmer. The closest match for the base color I could find was OPI The Impossible from the Mariah Carey Liquid Sands, but that one has the bigger glitter in it so it wasn't ever in dupe contention. The closest texture in my stash to Samba-dy Loves Purple was another OPI, My Current Crush. Below, it's Samba-dy on the left and My Current Crush on the right. My Current Crush is a touch darker and has more silver microglitter. I didn't find a match for What's a Little Rain Forest. 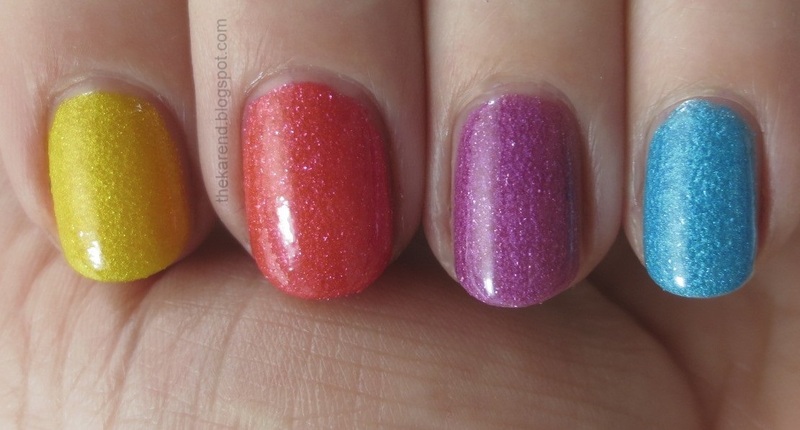 Left to right below: Zoya Liberty, OPI Just a Little Rainforest, Julie G Sleigh Ride. The OPI is light and less sparkly than either of the other two blues. I think these Beach Sandies are very fun colors; I just wish they were available individually in full size bottles. If you want to see more swatches and comparisons of these (and even some nail art), go look at this great post that Aggies Do It Better did on the Beach Sandies. I just found her blog, and she's got a lot of good stuff over there. I bought this set for my mom and used the purple on her... still not a fan of texture (and neither was she), but we both loved it with a coat of Seche Vite! I really want to get these but am holding out for full size bottles! Keeping my fingers crossed! Aaaaaw these are so cute! And I'm pretty sure that I absolutely need I'm Brazil Nuts Over You! Now this! This is what I've been waiting for. lol Love 'em! I love the way these look with topcoat! I love the look of What's a Little Rain Forest!